Find hotel near Les Baraques Military Cem .. This great military cemetery was built during the First World War when the British wanted a base in France that was nearer to their country. 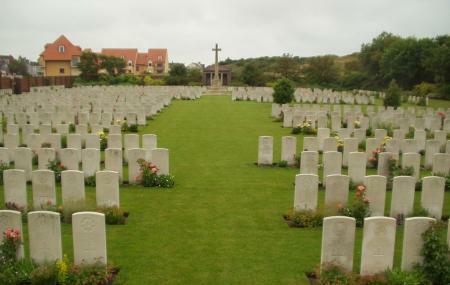 Built right next to Calais beach, there are mostly English soldiers buried in the cemetery along with soldiers of few other nationalities. Seeing the uniformly aligned, rows upon rows of white Portland stones that are carved with names, the cemetery is a calm and silent place to reflect and pay respect to the bygones. By Road : Located just off the Place du General de Gaulle roundabout on D940, towards Sangatte. Nearest Bus Stop : Eglise Belriot, Lines: 03, 05. How popular is Les Baraques Military Cemetery? People normally club together Calais Lighthouse and Royal Kids Parc De Jeux while planning their visit to Les Baraques Military Cemetery.